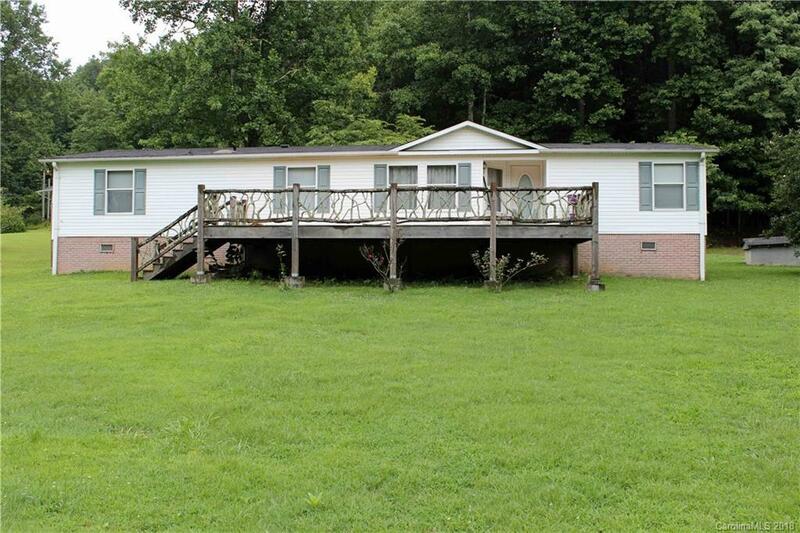 Excellent buy in this really large doublewide on a permanent brick foundation. Level yard, level garden, bold running creek. I just love this location with less than 12 miles to Brevard & a mile or so to Rosman. Have you had just feel good feeling when arriving in an area? Well, this is it! Wonderful Country setting with vegetable farms & farm animals & level roads. Unrestricted .66 acres, garden-pasture area & a bold fresh running creek as well as included is a small outbuilding (corn crib) for all your gardening tools. One level living offering an open floor plan & split bedroom with a laundy room. 2 Bedroom septic but the house has 3 bedrooms, or 2 bed & 1 bonus room-office. Large open kitchen, big laundry room-potential pantry, large living room, rock fireplace with gas logs. The front door opens to a huge deck overlooking the farm-valley with sounds of the creek. Large master & master bath with new laminate flooring. This home is priced to sell, so you better move quickly.